On January 24, 1848, James Marshall discovered gold at Sutter's Mill on the American River in Coloma, California. News of the discovery set off one of the largest human migrations in history as a halfmillion people from around the world descended upon California in search of instant wealth. In the first 5 years of the California Gold Rush, more than 12 million ounces of gold were found, but very few people got rich from it. The greatest impact of the gold rush was the growth of the area, leading to a flood of western pioneers and the admission of California as the 31st state of the Union. In 1898, gold was discovered along the border of Alaska and the Canadian Yukon. More than 100,000 prospectors braved the harsh terrain and dangerous conditions of the Klondike region to seek their fortune. Like California, the influx of people led to dramatic growth in the inhospitable territory. An American Mint exclusive, this stunning 5-piece set captures the adventure and thrills of the greatest gold rushes in U.S. history. 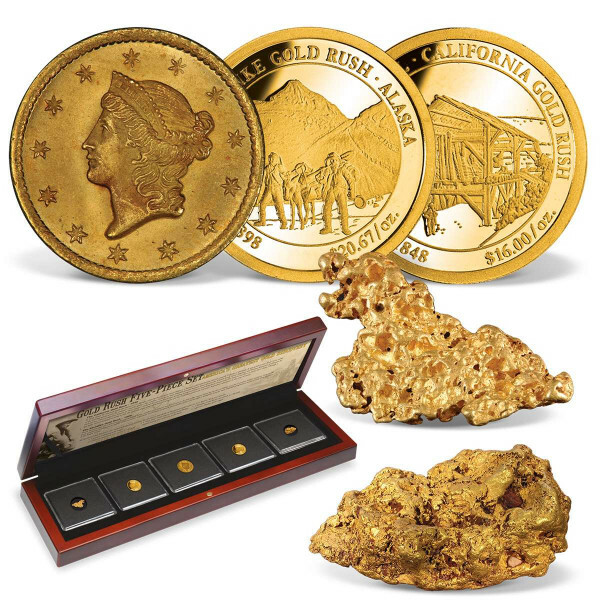 Included in the set are two 14k gold coins commemorating these historic events, two authentic gold nuggets from California and Alaska, and a genuine 1849 Gold Dollar, which began production following the California gold rush.